You can find more information about Anti-Bullying Week here. Your Learnanywhere course could start with an introduction to Anti-Bullying Week and the theme for this year. If you are allowing parents to join in you can add extra information that your students may find of interest but parents will find very useful. We recommend involving parents in this activity, as it shows how serious and proactive your school is regarding bullying, cyberbullying and e-safety. You can follow the guidance and use the resources supplied by the Anti-Bullying Week website and add in other resources and activities that you see fit. You can also use this as an opportunity to address any issues you are currently experiencing in your school. Cyberbullying is bullying that takes place using technology; mobile phones, tablet computers, laptops, games consoles and social networking sites like Facebook can all play a part in cyberbullying. Cyberbullying differs from other types of bullying in that it is always there: Children cannot escape from it at home – in fact wherever you are, there is no hiding place. Young people need to realise that they can become involved in cyberbullying without realising or understanding what they are doing. Even just being involved ‘on the edge’ can have a huge impact on how the person being bullied feels. Using digital technology to deliberately upset, hurt or embarrass someone else is bullying. This includes writing or liking a post or comment, tweeting, posting pictures and sending texts. ‘Liking’ or simply commenting ‘lol’ can make you become part of the bullying. It could be perceived that you are ‘ganging up’ on the victim. To mark Anti-Bullying Week, we’ve created an anti-bullying course ourselves. Here’s how it looks. A six minute video about cyberbullying. It follows a teenage boy who is being cyberbullied and what he does about it. Childline website containing information about cyberbullying, and what to do if it is happening to you or someone you know. Leaflet downloaded from Childnet International with lots of information and guidance. Instructions and an example of the work required. Pupils will create a written piece and then use it to start a discussion about the effects of cyberbullying and how it can be beaten. Instructions to create a three-question survey, get responses and then present their results using charts. Details about a school competition to create an A4 poster, raising awareness of Cyberbullying and encouraging all to stamp it out. Links to the Childnet International website giving information about using video cameras safely and appropriately online. The instructions in the forum ask the pupils to use this space to discuss cyberbullying and asks them what they think of it and what would they do if they, or a friend, was being cyberbullied? Do You Know Your Facts About Cyberbullying? A range of questions to reinforce pupils’ knowledge and understanding of cyberbullying. 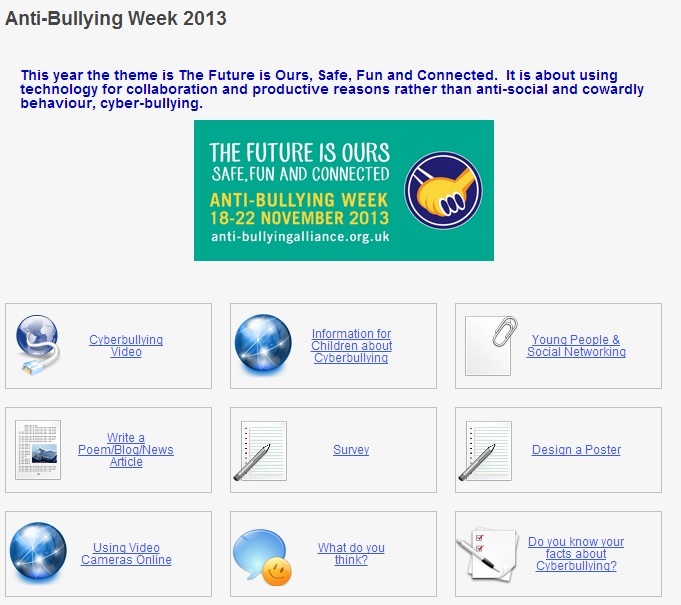 If you use Learnanywhere, we will be uploading thee above resources in Cirrus shortly, with the tag antibullying2013. Find one or two good sources of information and stick to them. Think You Know is part of CEOP, so possibly one of the best.